The oil complex is trading flat this morning. Crude made minimal gains yesterday, closing just 16 cent higher. Crude has kept its stagnant position this morning, trading down 25 cents at $67.94. 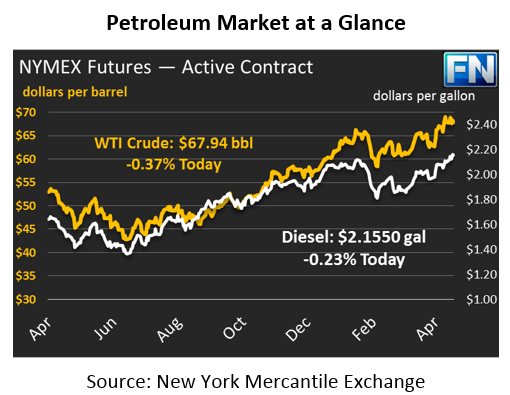 Absent of market moving news today, crude will likely end the week unchanged to slightly lower. Fuel prices are mixed this morning. Both products gained around 2 cents during yesterday’s session, despite the decline in crude prices. Today, diesel is trading at $2.1550, down 50 points from Thursday’s close. Gasoline prices are up a measly 6 points this morning to trade at $2.1129. Market moving news is lacking this morning. On the global front, the Brent-WTI spread has reached its widest spread this year at $6.55/bbl. Khalifa Haftar, one of Libya’s most influential military leaders, suffered a stroke two weeks ago. Hafter is credited as the driving force for Libya’s rebound in crude oil production. The market fears that if Hafter is unable to fully recover, the absence of a strong military presence could lead to a violent power struggle, putting crude output at risk. Analysts are estimating that 600-700kbd could be at risk, which would put upward pressure on prices. Combined with the uncertainty around the Iran nuclear deal, prices could continue pushing higher over the next few weeks.